Cancer patients in the BMT unit at Christchurch Hospital will now have access to electric lift beds at Canterbury Regional Cancer and Haematology Service. These beds are more expensive than standard hospital beds, and offer options such as electric high-low function, so that patients can get in and out more easily, and electric backrest for comfort. Auckland City Hospital is building a new BMT facility. 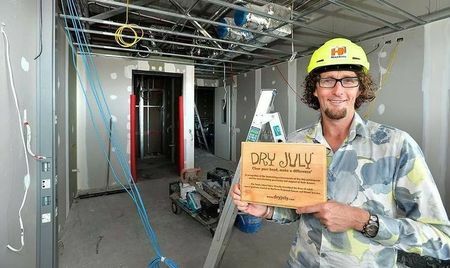 The hospital is using some funds from Dry July 2013 towards the fit-out of and furnishings in of the planned Wellness Room. This project has been developed based on feedback from patient consultation undertaken during the design phase for the BMT building. Wellington Blood and Cancer Centre used funds from Dry July 2013 to purchase an iPod and stereo system to provide entertainment for patients receiving radiation therapy. Radiation therapy can be a nerve-racking experience for cancer patients. While having treatment, patients can communicate with radiation therapists through intercoms but are alone in the treatment room. Having the option to listen to music can help patients relax. Wellington Blood and Cancer Centre recently purchased new gowns for patients receiving radiation therapy treatment. Standard hospital gowns can have patients feeling unnecessarily exposed; these purpose-designed gowns are special ordered and improve privacy, patient dignity, and comfort by including more access points. Wellington Blood and Cancer Centre is purchasing Dominion Post subscriptions with funds from Dry July 2013. These will be available to cancer patients and carers in treatment areas and wards.